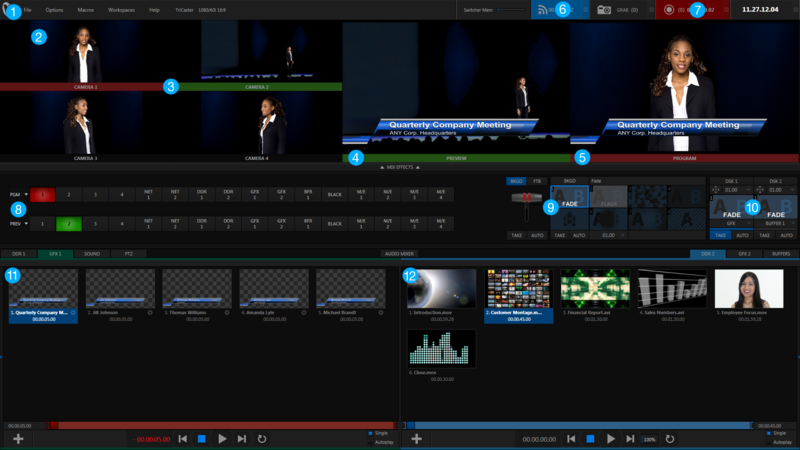 TriCaster Mini Interface - Nelco Media, Inc. Observe your choice of live video sources in real time with customizable monitors and selectable layouts. Connect up to 4 live cameras or video sources, with automatic detection of resolution and frame rate for simple setup. Set up and preview your next shot or video composition. Monitor the output of your live video program as it is being broadcast, recorded or streamed live. Launch live streaming video to the Web in resolutions up to 720p, with presets for many popular streaming providers and profiles. Record your live program from beginning to end, or capture the footage from every camera simultaneously. Switch between multiple cameras, video feeds, network sources, stored media, and graphics, with transitions and effects, to produce live video programs in resolutions up to 1080p. Use animated effects to switch between sources and apply overlays, with button or T-Bar control. Layer titles, graphics, video or other visuals over your live video program. Display images, apply titles or present graphics. Choose from ready-made title templates or load your own designs. Load and playback video clips, packages and motion graphics in virtually any file format.